Today we kept Thing1 out of Kita to spend the day speaking in English. Tomorrow is her English test and we are pretty certain that she is going to fail it. This entire situation has been a bit of a cluster. When we came to Germany, we were greatly concerned that the girls' lack of German would cause them social problems (and loneliness). After much discussion and speaking to a pediatrician, we put them in a German Kita so that they could learn German and socialize (and so that I could take a German course as well). The German made a point of speaking only Deutsche to the children. When Thing1 had her 5 year check up in July, the pediatrician was concerned that she was still behind with her German and had problems with some vowels. Now, in November (actually since August, when they spent a week with the grandparents) Thing1 preferentially speaks German and she has lost her "th". I have great difficulty getting her to speak any English (although she still understands everything) and Thing2 is mutter sprache Deutsche. This is a problem because my German is so limited. It is also a problem because the bi-lingual schools here accept on the Engish and German mothertongue sides differently: there is no problem for English mothertongue speakers and a great oversubscription (and consequent lottery) on the German mothertongue side. If Thing1 fails the test, I am not certain that we can get her into a bilingual school and that would be a catastrophe. We do expect to return to the US and there are really no paths to German integration into the US school system. Since she will already be one year behind the US (children start later here), I can't imagine how damaged she will be if she loses more time to become English fluent when we go back. When I am not so tired, I will write up a long post on how this system works and how totally messed up foreigners are b y it. So we booked lunch at the Reichstag, following the recommendation that doing so would allow us to bypass the security line (which it did- we had no line at all at our separate entrance and the friendly security man allowed Thing1 to use the bathroom while we waited for the (extremely slow) elevator). 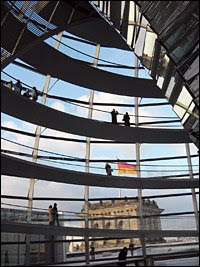 We ate at the Kaefer Berlin im Deutscher Bundestag, and as this article states, had a fabulous view. I found the food to be adequate and the German pointed out that we were the only diners not to order the veal Schnitzel. My beef rouladen with knoedel and rotkohl was decent, th e German's Venison with noodles and "cranberries" was too salty (though he ate it) and so was Thing 1's Noodles with red sauce (on the side), which she did not eat. Hard to believe anything could be too salty for me, but I gave Thing1 some of my rouladen to eat instead. We had a nice pate of deer with salad as a starter and for dessert Thing1 had a Disney Eis (a Donald Duck mug filled with strawberry and vanilla ice cream, two waffle cookies, and two decorative streamers) which she loved. The German and I shared a creme brulee, served in a high cup and a little too sweet and a little too liquid, but arranged nicely on a plate with some streaks of passionfruit and mango puree. Then we wandered through the dome. It's just gorgeous. After letting Thing1 run about (it was more fun than the Habitrail Gem exhibit at the Museum of Natural History in New York) we had to run to get home before Thing2 got back from school. We grabbed the 100 to the Zoo and then a cab home and made it with 6 minutes to spare. Then I ran off to go shopping (it's at least every other day here) and when I got back the German went to his scheduled haircut. When he got back, he grabbed the two computers with destroyed power cords (remember, we had 3 but the Mac was under warranty) and brought them to the corner computer shop, where he picked up an adaptable power cord (clearly, we expect this to happen again). A bit of a struggle later, the girls in bed, we return to deal with open enrollment periods that don't allow access from German work computers: I don't know when we will ever be able to send the one from the US back! Thanks for visiting my blog. I just wanted to ask you if you liked "French by Heart," as I just finished reading it and loved it. Wishing Thing1 lots of luck on her test! Sorry to hear you are struggling on the language front - it also freaks me out that my kids could be behind in English if we had to move. That's why, etc, etc, the bilingual schools are still on the cards. We need to talk! Again, I intro with "Wow." I returned to Braja's blog and read your comment about the con men/ mortgage lenders. I pray (yes, pray) that your little ones perform(ed?) well on their test - as mothers, we worry openly about our little ones and their future as it relates to our daily impact on their development, don't we? I must say, as well, that your life sounds adventurous - moving from high profile New York to Germany! Yet, I know that each of us gets caught up in the everyday-ness of feeding, bathing, clothing (and educating!) those little ones! On a different note, I do hope one day to crush the stereotype of "Republican" - in a day and age when tolerance is embraced except with Christianity and 'the middle class, midwestern, Christian American white person' - those of us who are psychotic in our religious beliefs, infantile, and uneducated. I would not choose to use these words to describe a person with different political views than mine. And I do believe that each of us has a personal responsibility to the other, including when choosing terminolgy to describe alternative thinkers. Yet, it is your blog. I hope one day our two sides will meet somewhere in the grey area of the middle. Thanks for stopping by. As a recovering Republican- one who was Republican for 24 years of actually voting- I hope that one day the Republican party will once again include people other than the old and the intolerant and those who haven't looked at the leaders of their party(after all, how many years did it take to alienate me- I voted for Reagan in my first election!). However, if you read my blog I think you will notice that nowhere do I malign white midWestern Christians: I have lots of friends who fit those labels. When I talk about religious psychotics- and I do- I am speaking about people whose religious views hold no tolerance for my views of either religion or how I should be allowed to act within the parameters of my own life. I am very careful in my adjectives, I think. As a woman, I was and am personally offended by Senator McCain's choice of Gov. Palin and I would be more than happy to discuss why I feel this way in a more personal forum than the comments here, although I think I did go into my reasons (in many places!). Interestingly, where I see intemperate language (Marxist, socialist, Euro-C*mmie, Pinko) it does not seem to originate on the left of center (in the US- here in Europe it comes from both sides- but the sides here are very left of America's center).Thanks for the comment and please- stop by when I am not feeling so political. THat depends on what is going on in the world of course- I have never been so unhappy politically, economically, and socially wth my country than I have been in the last two years. I think you will see that the underlying theme in my comments on the US is my extremely high expectations: it hurts me when my country fails to live up to them. We have german/American friends here with two kids. Although the primary care giver was the native English speaker and spoke only English with them, the kids only spoke german. Because of their dual citizenship they qualified for JFK regardless and now the eldest has been there a few months he's using English a lot, although admittedly with an accent and some typical German grammar errors. But after a few months of English in school the improvement to his active English has been huge. Not that I'm trying to brush over your concerns - one of my big fears is that any child I might have would not speak my language as a native does (and will never really understand my culture)- so I understand being upset by that. I hope the test goes well! Thanks, Dr J. I am so relieved to hear you say that, although I can tell you that is not the way the other bi-lingual scgools work and it's not exactly the way JFK's principal says the school works in terms of entry. Because Thing1 is not in the Entry Class (we didn't even know we would be in Berlin when the deadline passed for that)she is competing for entry in only a few places (8, I think, on the English side) and then there is a lottery for the German side. I certainly hope our circumstances act asan appeal mechanism if she fails. And I know other children born to US citizens and German spouses who have failed the language test. Ok. I am still stressed but thanks for the pep talk!And take away this lesson- use the minority language between the parents at home! Wow, sorry that the language thing is causing you so much stress. Would they not take individual family situations into account? I think the fact that you're pretty sure you'll be returning to the US would be a big factor in the decision. I'm crossing my fingers that the test went well. I guess the only thing you can do if your daughter doesn't get into a bilingual school is to register at a German school and then ruthlessly switch to English *only* at home for both kids and do a bit of homeschooling on the side (illegal in Germany but not if the child is already attending a regular school) according to the US curriculum. My first job in Germany was at an English-language publisher with about a dozen expats working as copy-editors. (It's where Nate works now.) Their experiences with bilingual children up to age 12 was pretty much the same. While they could understand English perfectly, they would refuse to use it. When spoken to by the expat parent, they would answer in German. However, when visiting relatives in England or the States, their English abilities magically returned and they could hold normal conversations again. These kids were all in German schools, of course. We all lived in the boonies, there are no international schools out here. The last day of NaBloPoMo. My newest passion is a soup. What I've been reading in links recently. I'm jus too tired to blog tonight. Tuesdays with Dorie- Twofer Pie. Why do my power cables keep blowing? When I wasn't looking, the last state was called. What type of Blog are you? What I've been reading recently in links. Tuesdays with Dorie- Arborio Rice Pudding. Wow, I wish I had posted this yesterday! It is sad. But it is also frightening.